Aero - Originally made by Rowntree, this chocolate bar has been manufactured by Nestlé since 1988. As a name, Aero has been in use in the US since 2005 for boys and 2013 for girls. It is a bold and interesting choice that fits well with other trendy names ending with -o. The same-sounding Arrow has also been climbing the charts. Almond Joy - Almond in French is Amande. If this happens to be your favorite candy bar, the name Amandine Joie would work in lieu of "Almond Joy" itself. Although, Joy is always a great virtue name. Joy was most popular in 1957 and 1974. Comparatively, it ranks lower today at only #436. 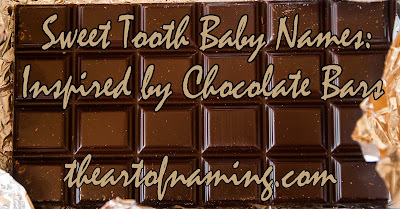 Baby Ruth - You may not write "Baby" on the birth certificate, but you could have your very own baby named Ruth in honor of your favorite chocolate, caramel nougat treat. This Nestlé-owned candy is said to have been named after President Grover Cleveland's daughter Ruth, so history buffs might also appreciate this name. Caramello - There's Carmelo and Carmella, why not Caramello? However, it has never had any usage on record, so feel free to start this trend, especially if you're a fan of caramel and milk chocolate. Charleston Chew - For a boy, Charleston has been used in the US since 1914. It has never been in the Top 1000 and received 87 births in 2015. For girls, however, the name first gained usage in 1997 and currently had 253 births for the year. It could approach the Top 1000 soon! Which gender do you prefer? And do you enjoy this chocolatey nougat? Clark Bar - I've featured this super name before, but here's the latest stats. The name Clark has been in use since the before 1880s in the US and peaked impressively in 1961. However, today's popularity high is nearly on par with that one. There were 858 boys named Clark in 2015, for a rank of #373. There were also 15 female births. Heath Bar - This name peaked in 1974 at #181. These days, Heath is down at #832. It would be interesting to find out how the late Mr. Ledger affected this name's popularity, if at all. The name has also been used on a handful of females back in the 1970s-1980s. What do you think of Heath? Hershey's - This male name was featured in the previous article as well, but since it's a big company with chocolate bars with the same name, it's worth mentioning again. As a name, Hershey has only been used at the bare minimum levels to be recorded, and only between the years 1914 and 1954, plus 5 births in 1982. A rare name! Alternatively, there's the similar-sounding Hershel that is more common. Holly Bar - Holly is a name that is starting to fade from popularity recently. It was biggest in the 1970s and 1980s but has now dropped to #490 in 2015. It will most likely continue downward, but it is still a lovely choice. It is reminiscent of both a plant, and the chewy French nougat bar that's covered in chocolate. Kit Kat - Kit is a diminutive of both Christopher and Katherine, while Kat also comes from Katherine and related names. This playful name works well for the crispy chocolatey wafer bars. As far as popularity goes, Kat is rarely used alone, but Kit had 28 female births and 40 male births in 2015. Lindor - The Lindor chocolate truffles from Lindt are a fancy treat. However, there have not been any births on record for the name Lindor in the US. Doesn't it sound like it could be a cool masculine form of Linda? Perhaps one of you chocolate-lovers could use it for your son to honor an aunt Linda. Milo Bar - This caramel brownie treat is covered in chocolate and produced by Nestlé in Australia. And what a great name it has! Milo is one of those up-and-coming trendy choices for a boy. It is currently up to #288 in 2015. It was down at #724 just 10 years before that, and it ranked beyond the Top 1000 if you look back another 10 years in 1995. Sister-name Mila is also up. Oh Henry! - This candy bar contains peanuts, caramel and fudge covered in chocolate, and has been produced since 1920. The name Henry ranked best around 1918, and still fared well through the 1940s. It took a dip in the 1970s-1980s but it is back on the rise, ranking as high as #29 in 2015. Orion - In the Czech Republic, the Orion brand chocolate bar has been hugely popular. It originated in Prague in 1896 and was acquired by Nestlé in 1991. There's also a company in South Korea called Orion Confectionery which makes cookies, pies, chocolate, candy and more, including its famous Choco Pie. Orion is not only a celestial name, it is also very chocolatey. And it has gained popularity in the past two decades, currently ranking at #368. Prince Polo - This Polish chocolate bar is also known as Prins Póló and sells well in Eurasian countries. You may be surprised to know that the name Prince has been consistently common since 1880. It ranked at #387 in 2015. Will it rise or fall in 2016 due to the passing of the music icon Prince? Polo has also been used as a name here and there over the years with 8 births in 2015. Reese's Peanut Butter Cups -These chocolate and peanut butter cups are best-sellers and well-known. The name Reese is rather popular too. It has been in use for boys since the 1880s, but only ranks at #701 in 2015. For girls, it gained consistent usage in 1992 and skyrocketed up the charts to its current #173. Do you like Reese more for a boy or a girl? Rocky Road - This is not just a great flavor of ice cream, Rocky Road is also a candy bar made of fluffy marshmallow and topped with cashews and milk chocolate. It is made by the Annabelle Candy Company. The name Rocky has been given to boys since 1913, and has also been used by a few girls over the years. There were 229 male births in 2015 for a rank of #927, and there were 6 female births. Rolo - The bite-sized ROLO pieces have a caramel center and are covered in milk chocolate. There are no births on record for the name Rolo, but if you add an L, Rollo was used well between 1881 and 1962. It started dying out after that, but suddenly gained 10 male births in 2015 after a nearly 30 year hiatus. Sky Bar - The milk chocolate-covered Sky Bar has been produced by Necco since 1938 in America. It is known for having four different sections with a different filling in each: caramel, vanilla, peanut, and fudge. As a name, Sky was given to 81 boys and 365 girls in 2015. The similar Skye has 58 male births and 845 female. Which spelling do you prefer and for which gender? Violet Crumble - This Australian chocolate bar has a crumbly honeycomb toffee center. It is made by Nestlé and it is also common in Hawaii. As a name, Violet seems to be a favorite lately. It has surpassed its previous high rank of #74 in 1919, by currently ranking at #50 in 2015. York Peppermint Patty - This cool, refreshing treat is filled with mint and covered in dark chocolate. The name York has a very unsteady popularity pattern. It's been around since 1880 in the US, but there are many years when it only scores 5 or fewer births for the year. Its ultimate peak came in 1971 with a record-high of 21 births for the year. 2015 was graced by 7 births. 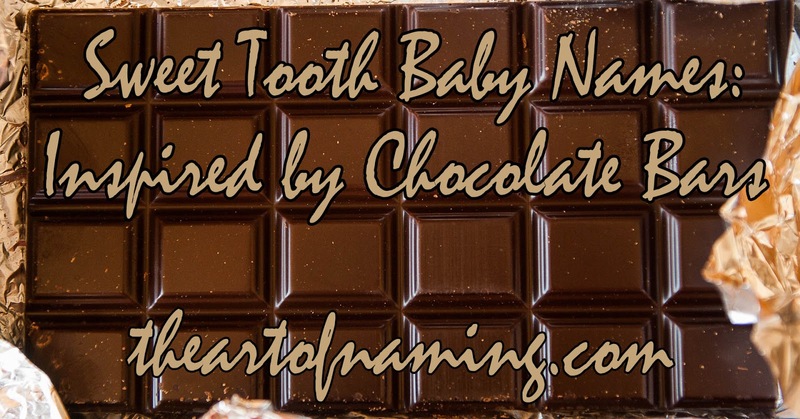 Would you ever name a child after your favorite chocolate bar? If not, that's understandable. But if your sweet tooth is beckoned, the above names are some of the best options around. 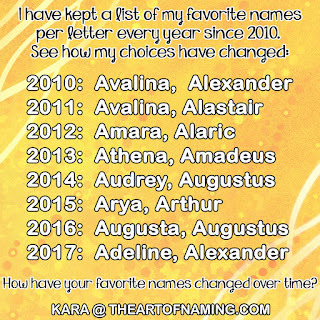 Whether you would use it or not, which name do you like the most?